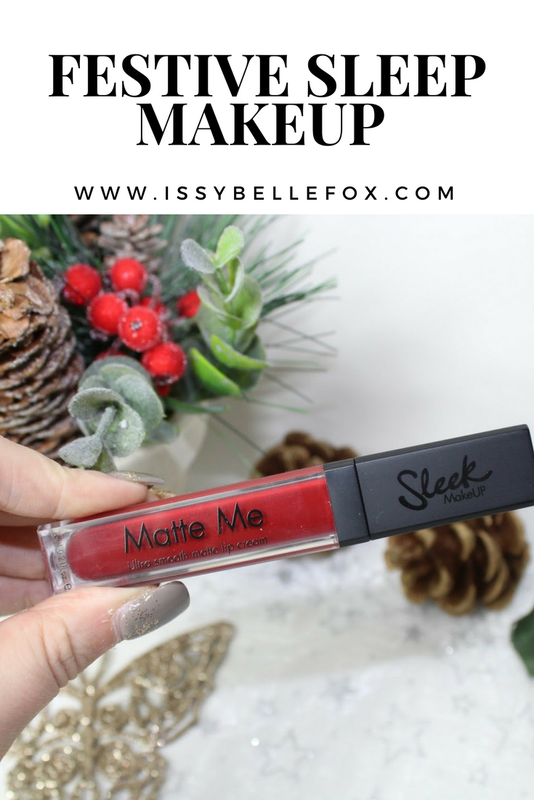 The festive period is the perfect time of year for bold red lips and all the sparkle, if you're looking to twinkle like a festive fairy on a budget then Sleek Make Up have got you covered. I was kindly sent some of their bits to try and was pleasantly surprised with each product. What is Christmas without a red lip? Not the same that's what! I love the Sleek Make Up Matte Me lip colours, they have an unbelievably light texture that doesn't make lips feel like they're clogged up with product, it can feel a little tacky once it's dried if you don't blot straight after application but this is easily fixable. The fact that only once coat is needed to create an even matte finish is why I love this product, it glides on without going patchy and the small doe foot applicator allows it to navigate lips without going over lines or smudging. It has some staying power too, as with all lip products general wear occurs after eating and drinking but it stands tall with it's high end competitors. This deep berry red shade is perfect for the festive period providing a dark crimson tone that can easily be glammed up with a metallic golden topper. Oh there’s not much I enjoy more than an oil free foundation, oil based ones do not get on well with my face one bit. For a foundation that costs less than a tenner I honestly didn’t expect much, I’ve been used to the likes of UD and Clinique for while so anything less than full, full coverage just doesn’t cut it for me. The Lifeproof foundation claims to be sweat proof and stick around all day thanks to its blurring effect and soft-focus powders. I put it to the test after a full day of working in an office where the heating is on an off as much as Serena and Dan (I’ve just finished Gossip Girl for the third time) as well as my blustery 20 minute walk to and from work and I can safely say that it put up a good fight against the elements. My skin is ridiculously dry so no matter what foundation I use there’s always going to be some fall out by the end of the day but this stuff was still there in most places. I’d say the formula is of medium consistency with enough thickness to build into the preferred amount of coverage, there was a very slight warm tone after oxidisation but nothing to be put off by. This is definitely a foundation that I’d buy again and I’d say it lives up to its name. I was over the moon when this palette arrived in my package, I’d been wanting to try it for a while but hadn’t got around to getting it. The Solstice palette comes in the most stunning insta-worthy gold packaging that doesn’t look remotely out of place sitting amongst high end products. The palette consists of two baked powders, one cream formula and a shimmer powder. Rather than use one shade I dusted all four across the top of my cheekbones and was immediately impressed with the iridescent, pigmented and metallic finish. The powders glided on with ease and stayed in place with the help of the cream-based quad allowing me to be ready to glow all day. The shades and tones of the palette are so complimentary of one another that it’d suit all skin tones. It’s safe to say that the Solstice Palette is on par with the higher end highlighters that I’ve used. I was most excited about these I-Art shades, we all know that I’m a lazy girl when it comes to eye make-up and my day-to-day work look consists of mascara and maybe eyeliner depending on time. I don‘t have time for blending and contouring my lids in the morning, getting into a pair of tights these days is enough of a struggle for me. These I-Art eye colours are a game changer, the super pigmented liquid formula comes with a tiny brush for specific application and the buildable and blend-able texture makes application an absolute dream. I lined mine over my black winged eyeliner to add a pop of colour and subtle shimmer to my eye look; this immediately upped my eye make-up look whilst taking the shortest amount of time. Sleek have 12 stunning metallic shades available and to be extra festive I will be adding Luminism to my collection. That highlighter palette is flipping stunning I love using mine! The lippy is a beautiful colour too. I love how affordable Sleek is and their highlighters are honestly some of the best around! The lip colour is gorgeous. Perfect for this time of year. I’m obsessed with the highlight palette, such great quality.